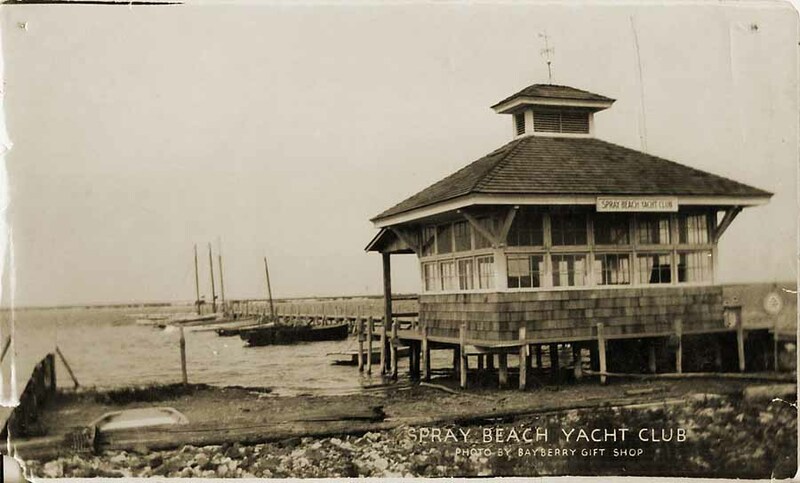 Spray Beach Yacht Club, founded on August 1, 1922, drew its original forty-one members, including three junior members, from the local community and long-term guests of the Spray Beach Hotel. Herman Schanche was our first Commodore and dues for the first half season were $2.50. In previous years, a dock for hotel guests stood bayside at the bottom of 23rd Street in Spray Beach. It was there on that stretch of empty beach we would make our home. By 1923, SBYC had erected a floating dock – it was all we owned. Docks were expensive, having to be taken down every fall and rebuilt the next season. Our first clubhouse was built in 1925 by William N. Shinn of Brant Beach. It would be another year before we could afford screens for the windows. Inspired by the new clubhouse membership grew rapidly. Family events involving sailing, swimming, and fishing took place throughout the summer. Large audiences gathered on our docks to watch the SBYC sponsored Catboat races. Dances, dinners, Bridge games, and masquerade parties were held at the Spray Beach Hotel. So popular was the clubhouse that by 1927 we commissioned our builder to double the size of the building. Club dues were kept low for many years because Spray Beachers wanted all their friends to be able to join. Though we were not an exclusive club, our membership included influential summer residents like Augustus Keil, the Eckman brothers, and Edward Gerhard a trombonist in the Philadelphia Orchestra and avid fisherman. We also proudly claimed among our members, the head of housekeeping at the Spray Beach Hotel, the wife of the local ice man, and a genuine bayman named Rowley Horner. 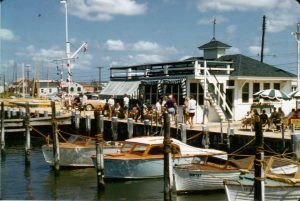 What our members had in common was a love of boats, the bay, parties and fun. Throughout the 1920s the club continued to grow happily and steadily, but things changed during the Depression. Very reluctantly, SBYC was forced to exclude friends who couldn’t pay their dues. By 1936, membership had dropped to thirty-one senior members. What might have been the end of the club became a challenge. Instead of closing the clue – our members, Commodore Pfeifer and the ladies in particular – undertook the huge effort of paying off the mortgage and gradually brought the club out of a large financial hole. By the 1940s, despite the war and the hurricane of 1944, life was returning to normal and the fishing on LBI was great. SBYC built a permanent dock and held numerous Junior and Senior races along with many family events. 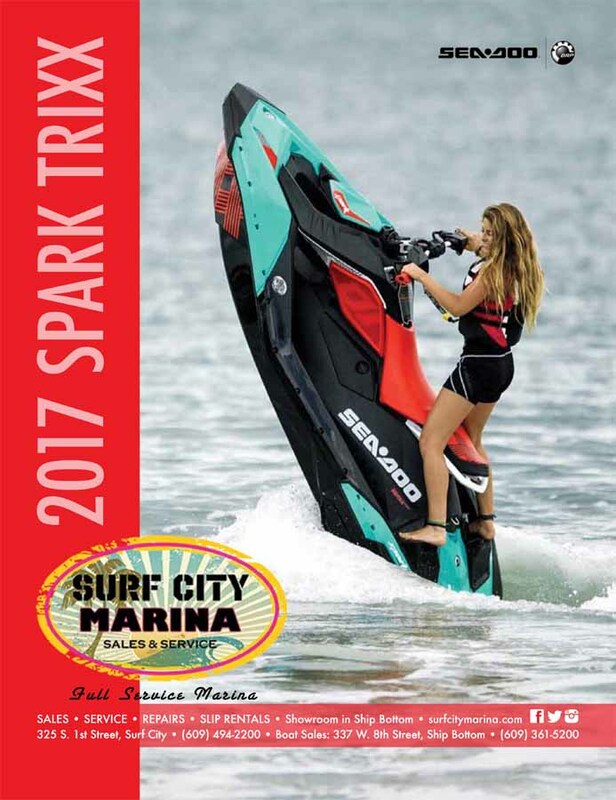 That summer brought the very fast and popular Bradford fleet – a sixteen-foot sailboat with a big mainsail – built by our own Neil Bradford, a Long Beach Township police officer. Later, the rise of one-design sailboats brought a new fleet of Lightnings. Our sailors showed their worth in 1951, when Johnny Teigland won the Lightning Internationals. Charles Doré came in third. SBYC would go on to host this big regatta in 1952. One of the Lightning skippers, Lud Wray, a noted football player became head football coach for the University of Pennsylvania. After leaving Penn, he and a friend bought a small team known as the Frankford Yellow Jackets and gave them a new name: the Philadelphia Eagles. When our new clubhouse was built in 1969, the original building became the Junior clubhouse. A second clubhouse soon followed. Docks were built, land was bought; fishermen and crabbers continued fishing and crabbing while our sailing fleets grew and multiplied. Today, as we approach our 95th season, led by Commodore Nick Grieco, Spray Beach Yacht Club has four hundred and eighty-five members, a strong Junior Program, and too many social events and activities to fit in this article. Yet some things never change – we still love parties, fun and heading out to the bay in boats. Photo at the top of this page: SBYC clubhouse, circa 1925-26. The water would come right underneath the building at high tide. SBYC Archives. Second photo: SBYC, circa 1958. The clubhouse is now larger, with land filled in behind bulkheads. The dance floor is to the right. Photo courtesy of the Schrader Family Collection.